You won’t believe what’s in this! Not one, not five, not even ten, but TWENTY cloves of garlic. You read it right. And if you’re like me, you probably laughed and thought “That can’t possibly be good” and wrote the recipe off. Several months after I first heard of this recipe, I was at a friend’s wedding reception and rather than serve their guests individually, they had opted for two long tables absolutely covered with beautiful catered food for everyone to serve themselves. As a food lover always looking for something new to try, I got a little bit of as many dishes as I could on my plate. Everything was delicious, but there was a chicken dish so good that I decided to go back for seconds. At the table, I asked one of the caterers who happened to be nearby at that moment what was in it. I was glad to know that I wasn’t the only person who thought a recipe calling for that much garlic sounded absurd. You can’t help but assume that with a whopping 20 cloves of garlic, the taste is going to be completely overwhelming – but it’s not! It’s a perfect mix of big flavors. As an added bonus, all those little cloves of garlic will be soft and spreadable. 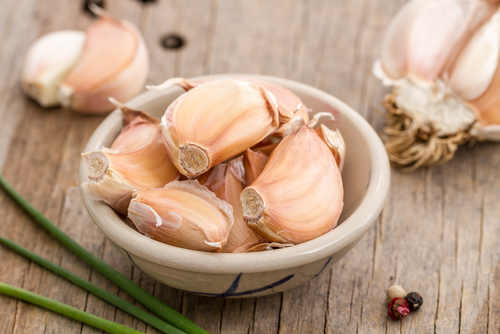 If you’ve never tried garlic that way, you’re in for a treat. A big, crusty piece of buttered french bread is the perfect vehicle for all that garlic goodness. Mix salt, paprika, pepper and oil to form paste; spread evenly over each piece of chicken. Place onion slices in a slow cooker. Arrange chicken over onion. Separate garlic into cloves; do not peel cloves. Place garlic cloves around chicken. Cover and cook on Low setting 7 to 8 hours. 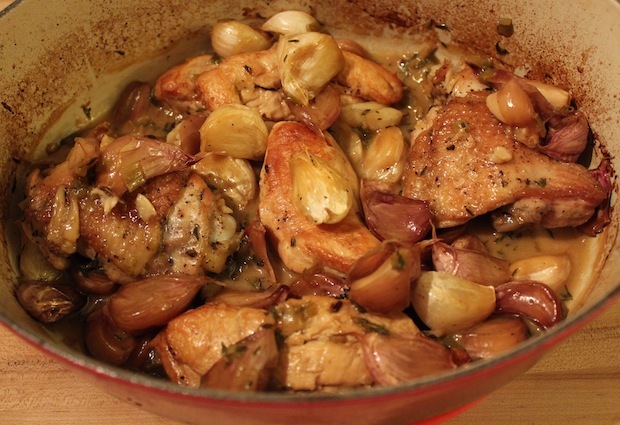 With slotted spoon, remove chicken, onion and garlic from slow cooker; place on serving platter. Squeeze garlic cloves to use cooked garlic on mashed potatoes, vegetables or bread. Quick Tip: If you want to save yourself some cooking time, chicken thighs cook faster than a whole fryer chicken. Thanks goes to Betty Crocker for this bold recipe!